Doing an urban bicycle tour of Portsmouth is a conundrum. While Portsmouth has a wonderful stock of old buildings, the whole place is undeniably depressing. It might have been because of the cold and gray weather that day. 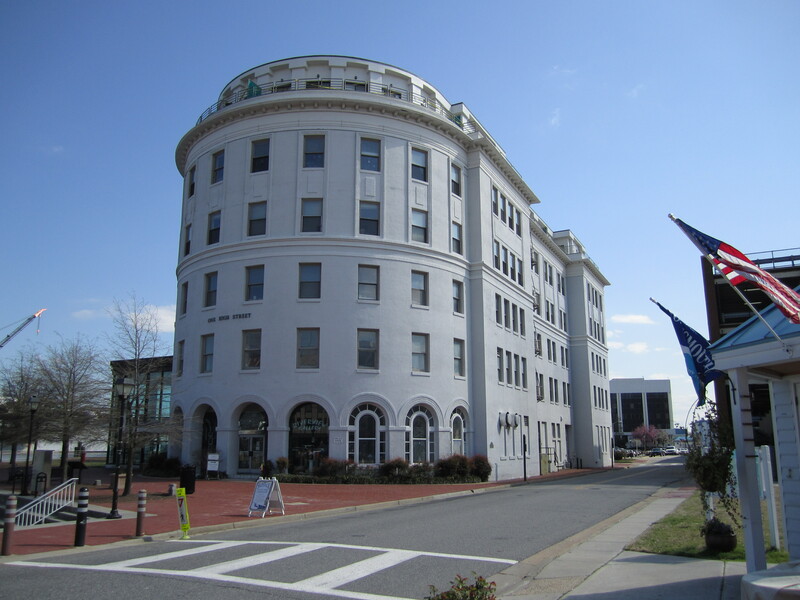 Contrary to Hampton Roads lore, Portsmouth is not all ghetto. When I asked Norfolk people about it, they talked desparagingly about crime. 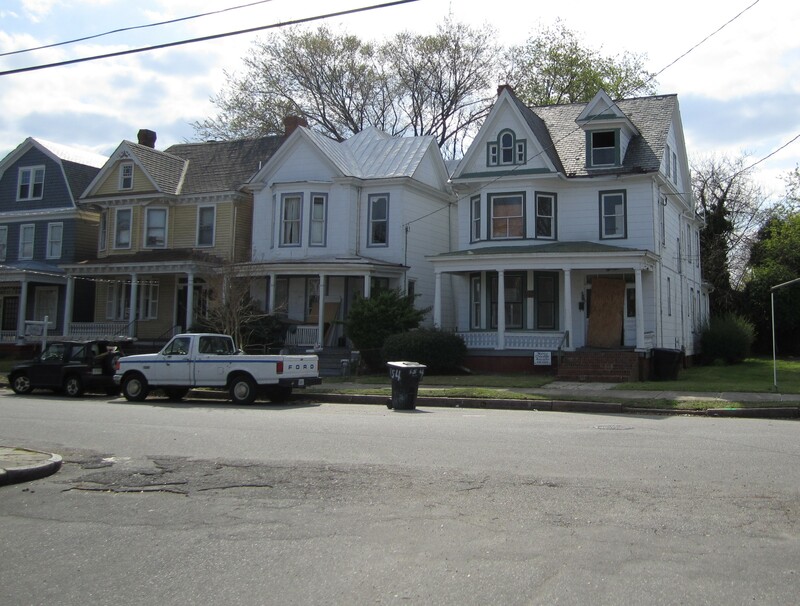 Portsmouth has some beautiful neighborhoods, but there is a grittiness about the place that permeates everything. I parked the car in downtown just across the tunnel from Norfolk. There were lots of parking spaces. Like Broad Street in Richmond, or (I have heard) Woodward Avenue in Detroit, everything in Portsmouth seems to permeate from one street, which is High Street. It is the main shopping street of downtown and it goes out to the furthest suburbs. The commercial part of downtown Portsmouth is predictably dead, with a few spots of life. There are a few bars and restaurants, there are the typical museums brought in by the government try to prop things up. The Commodore Theater, a movie theater, is amazingly still up and running. But eighty percent of the storefronts are empty. Surrounding downtown on the north side in Olde Towne. Despite the pretentious spelling probably instituted in the nineteen seventies, Olde Towne is really old, and except for the lack of commercial life, really a town. Lots of houses are built before 1800, and most of it is before the Civil War. 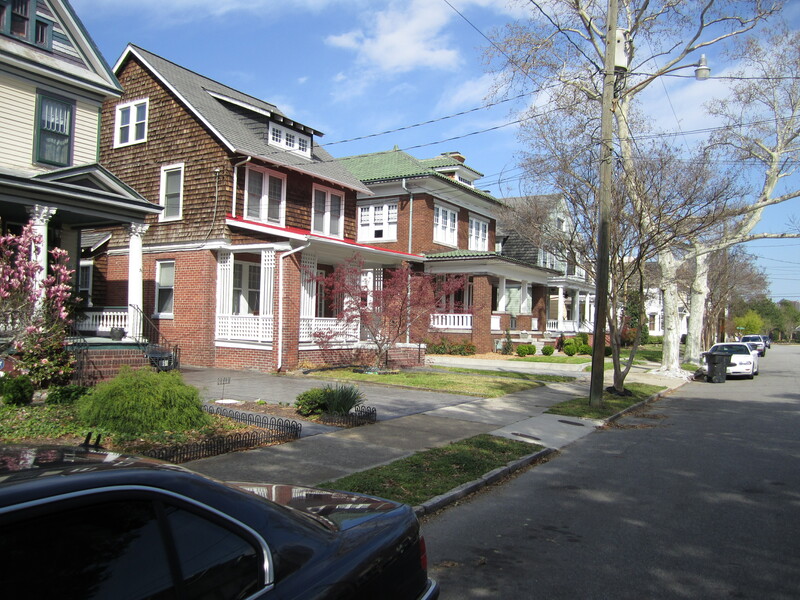 For Hampton Roads, it is the oldest, and really only intact neighborhood of its kind. You can walk down to the water’s edge and look out over the Elizabeth River to downtown Norfolk, less than half a mile away. There are several very narrow streets with eighteenth century buildings. Olde Towne seems to have survived the urban renewal efforts of the nineteen fifties and sixties. I might be because, even then, wealthy white people still lived there. West of Olde Towne, redevelopment must have taken hold. 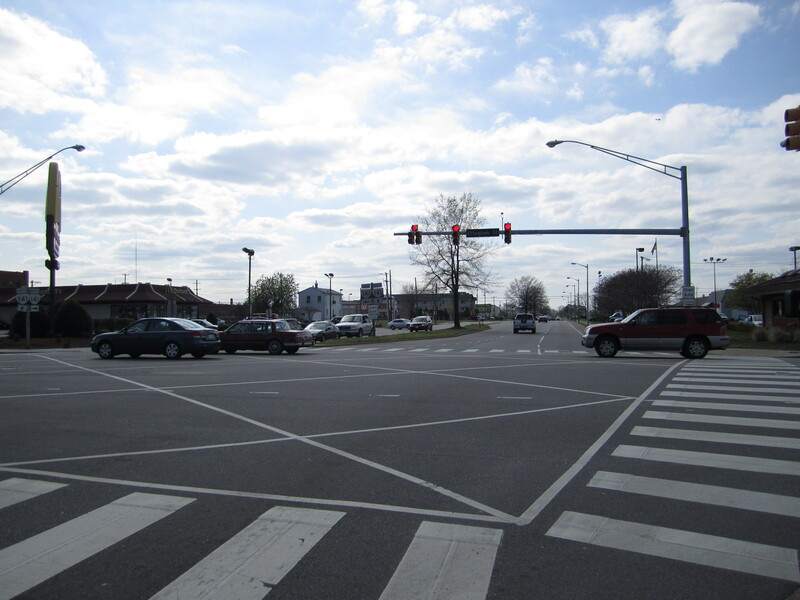 Olde Towne ends abruptly into a menage of chain restaurants and empty lots. They must have brought the nineteen sixties “redevelopment” wrecking crew up to just that point, and then had second thoughts about destroying the prettiest and most historic parts of town. After leaving Olde Towne the first couple of miles west of downtown are pretty bleak. But that is not the end of historic Portsmouth. This is, or at least was, a pretty big little city. Like Norfolk, the city spreads like tentacles over estuaries. There are bridges. Water is never far from any of these neighborhoods, and in most you can see the huge container cranes of Portsmouth Marine Terminal in the distance. 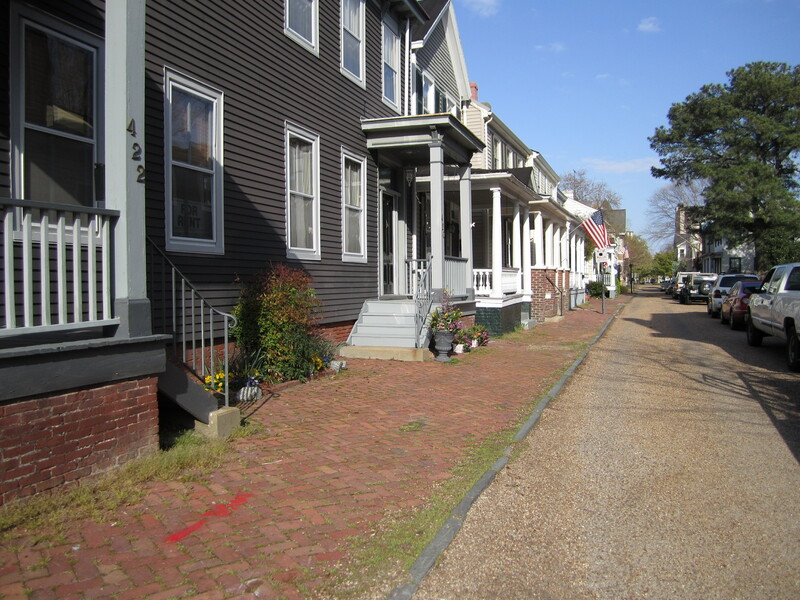 The best known of these late nineteenth century Portsmouth neighborhoods is Port Norfolk. Like several similiar neighborhoods, it is on a peninsula, and the main streets terminate onto the harbor. I theorize that it is populated in part by families that have lived there for generations. They live in mostly wooden two story houses. This is not, however, a yuppie neighborhood. A Starbucks, maybe thankfully, would not fit in. The whole neighborhood felt like it was still in the nineteen fifties. It is well preserved, but not too cleaned up or cutesy. I did have high school friends from Portsmouth, and most came from Churchland. This is a more upscale neighborhood further out west on High Street. I had been here before while in high school and college, but I do not remember anything at all about it. Like Port Norfolk, it is on spines of land jutting out onto the harbor. I circled through the curvy streets with houses looking out over the water. These houses were probably built between nineteen thirty and nineteen sixty. I remember Amy Ostrower’s party when I was a junior in high school, the kind of party we would drive to from Virginia Beach, twenty-five miles away, because her parents were not home. I took Mary Margaret Evans on several dates. Eighth grade buddy Ned Barham lived around here somewhere. I even went to Lou Hollowell’s Portsmouth debutante party. (Portsmouth had its own separate debutante scene!) Where did they specifically live? Before circling back over another of several bridges, I stopped for a sub at a Zero’s in a strip mall. While the shopping center called itself part of Churchland, it was partly empty, and included a second hand store. Just beyond was the line crossing into the city of Chesapeake, and miles of suburban sprawl. The last picture is not at all Port Norfolk actually… That is Naval Street & it resides in Park View just behind the gates of the Naval Hospital. It is an eloquent one block long street consisting of about 12 homes with extreme differences from one house to the other. It was originally named Admiral Lane in its beginning because it housed the elite officers of our armed services. The biggest house manicured in the center adorns dual circular staircases that lead not only to the second floor, but the third that homes a ballroom (where many balls were held for the high & mighty & aristocrats). The homes later played the role of hospitals, housing wounded soldiers. I had the opportunity to live in the corner home for 10yrs & I absolutely adored everything about it, except the traffic from the hospital… I think if you go in thinking badly, you will automatically find whatever flaws you can… Rather than adoring the beauty that this quaint town has to give.